In What Direction is Serbia Watching? The expected news from Serbia this week was new Prime Minister Ivica Dacic's first visit to Brussels and the reactions following this visit. 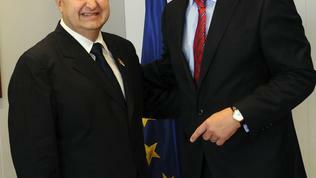 As a matter of fact, nothing spectacular was expected to come out from the usual statements, the sole more interesting thing was the whole atmosphere and the tone of the visit and all the other details (when Serbia’s new president was visiting the Brussels, some of his hosts could not recognise him, for example). But this time, nothing unexpected happened. 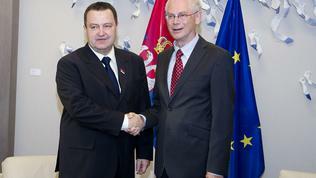 On its website, the Serbian government has published a total of four announcements following the first day of Dacic’s visit to Belgium: “No new conditions for Serbia’s European path”, “Serbia would seek a political resolution of the Kosovo issue”, “Serbia – firmly determined to continue on its European path”, “Serbia – a factor of stability in the region”. And among them another one: “A $300 million loan from Russia to support Serbia’s budget”. Do you still think that the result is 4 to 1 for Brussels? And no, this is not just another déjà vu. A small reminder – two years ago it became clear that Serbia would seek a loan from Russia to tap its budget gap. This time, according to the official statement, the loan was agreed during a meeting between Serbia’s Minister of Natural Resources, Mining and Special Planning Milan Bacevic and Russia’s Energy Minister Alexander Novak. According to this statement, Russia’s Sberbank will grant an almost $1 billion loan, with which Serbia will cover its budget deficit. The two sides have also agreed on a strategic partnership between Serbia’s 100% state-owned Nova Agrobanka and Sberbank, and about the sale of Serbia’s steel mill Zelezara Smederevo for $1. The reason: “Russia, as a counterpart, has shown understanding for the economic situation in Serbia, as well as for the situation in the banking sector”. In a given situation, this could be called a helping hand from a friend and there would have been nothing bad in it, if another Serbian “friend” - and that is of European Council President Herman Van Rompuy - had not pledged after meeting Dacic that “the future of Serbia lies in Europe”. 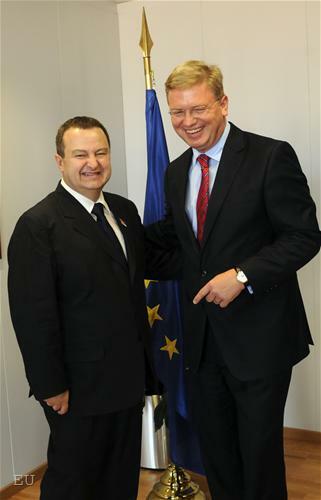 Dacic himself also said following the meeting that “it is important for us to enter a process that would end with the start of the EU accession talks”. There are two ways to interpret these pieces of news – either Dacic does not know where and for what reason he had sent minister Bacevic or he happened to be misunderstood again. The second option should not be excluded, as just a few days ago Dacic explained that he was allergic to everyone who wanted to give him a lecture, even EU officials, but after his visit to Brussels he told the Serbian state-owned TV broadcaster RTS that the Serbian society had a wrong idea about his visit during which he had six meetings with EU officials. “Nothing has changed. Neither in Serbia’s stance, nor in EU’s position. There have been no new conditions for Serbia’s entry into the EU. […] What we are asking our partners for is not to move the name-plate which says 'goal', meaning no new conditions will be added to the requirements set last December,” Dacic told those who failed to understand. In his words, the country failed to meet some of its obligations because of the paralysed political scene before and during the elections in May and most probably this will be included in EU’s next report on the progress of reforms of Serbia. Van Rompuy, in his turn, used the meeting to remind where exactly those reforms were needed: in the judiciary, the fight against corruption and organised crime, freedom of media and protection of minorities (of those well known so far), but also structural reforms, improving the business environment, boosting exports and alleviating unemployment under the new economic circumstances. "Normalising relations with Kosovo is the key for opening accession negotiations with Serbia. A sufficient degree of normalisation would ensure that both Serbia and Kosovo can continue their respective paths towards the EU and prevent them from blocking each other in these efforts".